Close Reading method is a popular reading strategy used by teachers in classrooms throughout the United States. Repeated readings and systematic analysis of the text provided by the Close Reading method, greatly impacts the comprehension of the reader. As readers use Close strategies, they are drawn deeply into the text as they mark, diagram and highlight the text in meaningful ways. When readers interact rigorously with the text, comprehension and retention sky rocket. 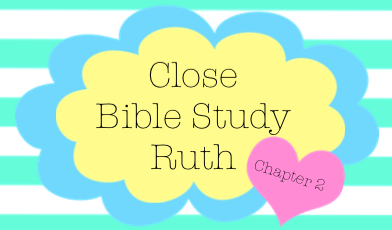 In part two of the book of Ruth Close Bible Study, we add an additional Close study method–reader generated questions. Today, you have the opportunity to ask and answer your own questions as you study God’s word. If you enjoy doodling as you study, you will love Close Bible study.Gather you Bible, makers, highlighters, and colored pencils and lets dig in! To download a copy of today’s study, please click on the link below. For additional resources on Close Reading, please access the following link.